The mighty Lord of the Apes (Gordon Scott) is on a deadly trail. He’s determined to find the diamond hunters (including Anthony Quayle and Sean Connery) who brought terror and death to a peaceful village. But as much as Tarzan is a tracker and avenger, he’s also a protector. An irresponsible gadfly from the so-called civilized world intrudes on his quest, and Tarzan knows he cannot leave her to fend for herself. 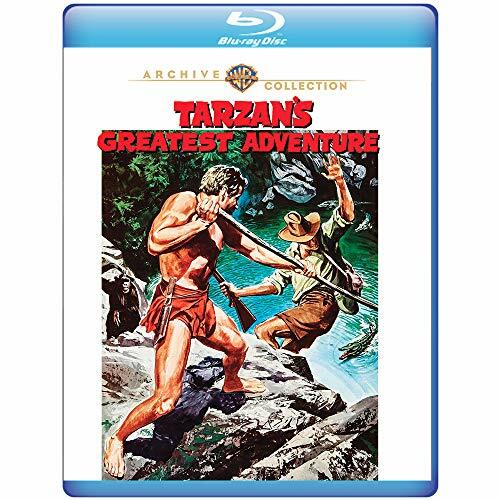 Tarzan’s Greatest Adventure is widely applauded as one of the best and most grownup films in the entire film annals of the jungle lord’s exploits. It’s “a superior action yarn shot on location in Africa, more adult than most of its predecessors. Tarzan has a much expanded vocabulary” (Leonard Maltin’s Movie Guide).